In 1968 when I was living in Arboledas, Estado de Mexico, my daugher Ale's godfather, Yorkshire man Andrew Taylor showed up at the door with an album in hand. "You're married to a Canadian. You should listen to this man." The album cover had this depressing photograph of a depressed looking man. Then we played it and two songs, Suzanne and So long, Marianne confirmed the man's depressed look. I could not believe that Andrew had spent good pesos on the record. 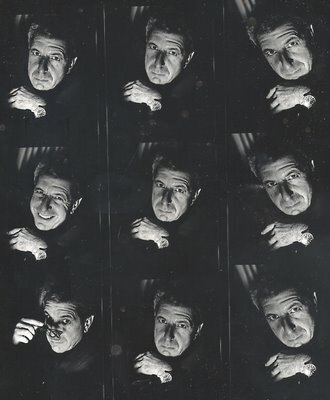 So it was with some unease that I faced Leonard Cohen in October, 1988. He was dressed all in black and looked scary. He told me, "I am a rotten apple at the bottom of the apple barrel who is a minority in Montreal. I am an English speaking Jew." And then he faced my camera grimly. While negative psychology has really never worked with my granddaughters Rebecca and Lauren, Cohen was receptive. I told him, "Under no circumstances are you going to laugh, or even give me a hint of a smile." And he did just that.